I know. I know. It's December and everyone has holiday baking on the brain, but my girl turns 6 today and I am committed to enthusiastically celebrating her birthday despite its being smack dab in the middle of the holiday gauntlet. As her birthday approached, Lilah informed me that she wanted cupcakes with blue frosting. While this description may not sound immediately appealing, I was determined to bake a dreamy cupcake to please the birthday girl and myself at the same time. The cake recipe is from Pamela's site and it's damn good. If you are gluten-free or need to bake a treat for gluten-free friends on their birthday, give these cupcakes a try and I think you'll be pleasantly surprised and so will they. I guess you could even bring some to a holiday party - everyone is loving cupcakes these days. Separate egg yokes from whites. Whip whites with a mixer until they form stiff peaks. In a separate bowl blend butter, Pamela's mix, and sugar. Mix on medium speed for 1 minute. Then add 1/4 cup milk, vanilla and almond extracts. Again mix on medium for a minute. Then add remaining milk and egg yokes, and mix for one more minute. Finally, fold in stiffened egg whites. 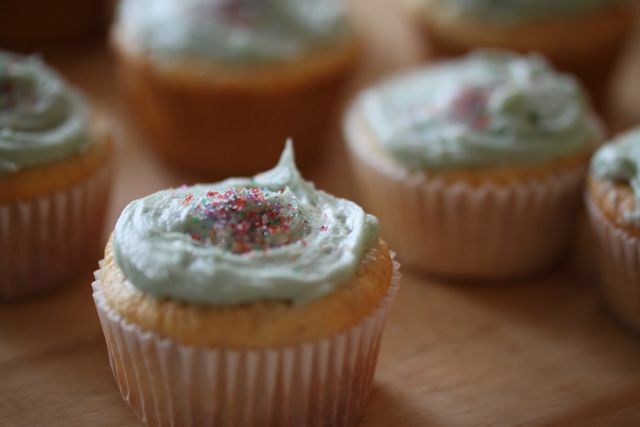 Pour batter into cupcake papers until they are just over half full. Bake for about 20-25 minutes. Touch the centers to see if they spring back; if so, they are ready. Cream together butter, sifted powdered sugar, and vanilla. Then slowly drizzle in cream (a few tablespoons perhaps) until you reach the perfect consistency. Add a few drops of food-coloring if you are so inclined. 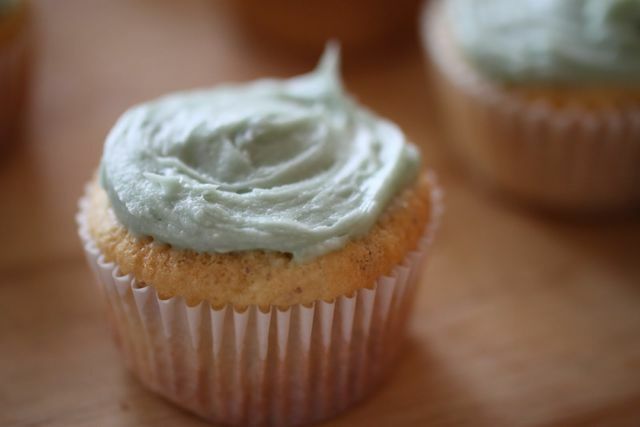 When cupcakes have cooled, spread frosting over top of each one. Add sprinkles. Live a little. They are cupcakes, right? I HAVE BEEN LOOKING FOR A CUPCAKE RECIPE ... A GOOD ONE. I have searched for two years... AND FINALLY, ON MOTHER'S DAY... i find this when i am throwing my daughter and her friend a little tye-dye and cupcake partY and realize Pamela's doesn't have a cupcake recipe on the back of their product. I wasn't expecting anything for mother's day but now i have the recipe/solution to ouchies (now) and broken hearts (later). Your recipe has made me a "sweeter mama." Thank you. I hope you all enjoy the cupcakes - my kiddos love them! Hi there, yes, the cupcake recipe is from Pamela's site. You'll note that I say that explicitly in the introduction with a link to Pamela's site. Giving credit where credit is due is SO important! Sorry you seemed to miss that in your reading. Thank you for the recipes. I have used pureed fruit to color frosting in the past, much nicer than the fake stuff and tastes better too! Thanks for this recipe. I'm wondering how far in advance I can make these and how should they be stored? For best results, I'd make and eat the cupcakes the same day. But the frosting can be made a few days ahead and then stored in the fridge in an airtight container. They are so freaking DELICIOUS!!! !